For those of you who completed the Baltimore Half Marathon this weekend… A) well done and B) do you have any bits that hurt? I’m not a long-distance runner. I like a sweet 5K and then I’m done. One of the reasons I keep my running to a minimum is because of running injuries. I do so much other exercise that I don’t want to mess up my knees or shins. These are frequent complaints that I hear from runner friends. One of my friends has a real knee problem from running and over the past week, before the half marathon, she’s been using Arctic Ease ® Cold Wraps, which provide relief from pain and swelling, in a nice tidy wrap, and without the inconvenience of a bag of peas or a gel pack. The great thing about these, she says, is that they stay in place and can be worn whilst she is running because the wrap provides relief for up to three hours. So, how did she do in the half marathon? 2:23:22 – that’s a pace of 10.57 per mile, which is AWESOME, especially with a dodgy knee! I didn’t feel a thing, she said with a smile. How do the Arctic Ease® Wraps work? 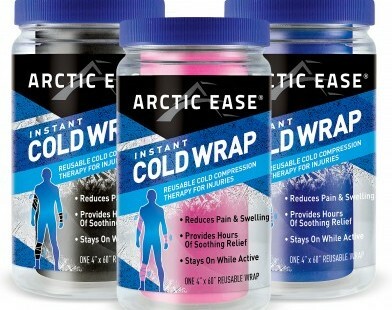 Arctic Ease® wraps are a two-in-one solution, that provide cryotherapy and compression. Cryotherapy and compression help by reducing pain and swelling, whether from arthritis, muscle pains, strains, sprains, repetitive motion injuries, or bruises. Once Arctic Ease® wraps are applied, they’ll stay where you put them without the need for tape or clips. Arctic Ease® wraps can be used before, during and after exercise. Arctic Ease® wraps are odor free and contain no medications, menthol, or alcohol. Best of all, the Arctic Ease products can be safely worn for hours! Arctic Ease products contain No Parabens, Synthetic Fragrance, Sulfates, Paraffins, DEA, Petrolatum, or Mineral Oil. You can get these little wraps of joy for runners at CVS, Giant, BJs, and many other stores. Check them out runners and be free from the pain!